ApplicationWindow is a Window subclass that offers some extra functionality for better integration with Application features. Notably, it can handle both the application menu as well as the menubar. See set_app_menu and set_menubar. This class implements the ActionGroup and ActionMap interfaces, to let you add window-specific actions that will be exported by the associated Application, together with its application-wide actions. Window-specific actions are prefixed with the “win.” prefix and application-wide actions are prefixed with the “app.” prefix. Actions must be addressed with the prefixed name when referring to them from a MenuModel . 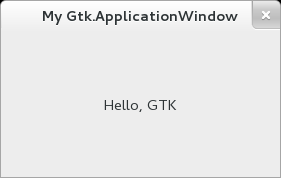 The settings gtk_shell_shows_app_menu and gtk_shell_shows_menubar tell GTK+ whether the desktop environment is showing the application menu and menubar models outside the application as part of the desktop shell. For instance, on OS X, both menus will be displayed remotely; on Windows neither will be. gnome-shell (starting with version 3.4) will display the application menu, but not the menubar. If the desktop environment does not display the menubar, then ApplicationWindow will automatically show a MenuBar for it. This behaviour can be overridden with the show_menubar property. If the desktop environment does not display the application menu, then it will automatically be included in the menubar or in the windows client-side decorations. The XML format understood by Builder for MenuModel consists of a toplevel `<menu>` element, which contains one or more `<item>` elements. Each `<item>` element contains `<attribute>` and `<link>` elements with a mandatory name attribute. `<link>` elements have the same content model as `<menu>`. Instead of `<link name="submenu>` or `<link name="section">`, you can use `<submenu>` or `<section>` elements. Attribute values can be translated using gettext, like other Builder content. `< attribute>` elements can be marked for translation with a `translatable="yes"` attribute. It is also possible to specify message context and translator comments, using the context and comments attributes. To make use of this, the Builder must have been given the gettext domain to use. The following attributes are used when constructing menu items: - "label": a user-visible string to display - "action": the prefixed name of the action to trigger - "target": the parameter to use when activating the action - "icon" and "verb-icon": names of icons that may be displayed - "submenu-action": name of an action that may be used to determine if a submenu can be opened - "hidden-when": a string used to determine when the item will be hidden. Possible values include "action-disabled", "action-missing", "macos-menubar". The following attributes are used when constructing sections: - "label": a user-visible string to use as section heading - "display-hint": a string used to determine special formatting for the section. Possible values include "horizontal-buttons". - "text-direction": a string used to determine the TextDirection to use when "display-hint" is set to "horizontal-buttons". Possible values include "rtl", "ltr", and "none". If this property is true, the window will display a menubar that includes the app menu and menubar, unless these are shown by the desktop shell. Gets the ShortcutsWindow that has been set up with a prior call to set_help_overlay. Returns the unique ID of the window. Associates a shortcuts window with the application window, and sets up an action with the name win.